The first line in latin of Psalm 137: “Super flumina Babylonis” – By the rivers of Babylon – the beautiful lament of the Hebrews in exile. 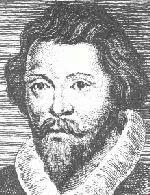 … Philippe de Monte (1521-1603) and William Byrd (1540-1623). Two composers – one Flemish, one English, both catholic. 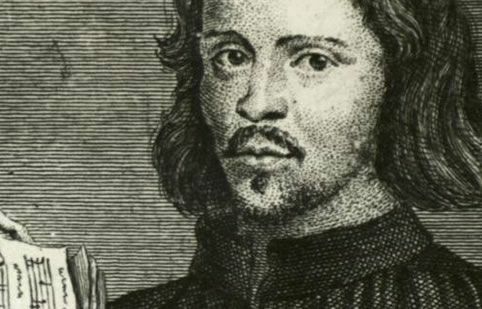 Byrd was a student of the great Thomas Tallis. His gift for music really emerged in Elizabeth’s reign, when he became a sort of “house” composer for the queen’s Catholic subjects. The Volta required the partners to dance in a closed position but with the lady to the left of the man! The man held the lady about the waist, and the lady put her right arm on the man’s shoulders, and held her skirt with her left. This was necessary to stop it flying up, because the dance involved the man lifting the lady using his left thigh under the lady’s right thigh. Confused? I’ve read that there’s an accurate performance of the dance in the movie Elizabeth: The Golden Age. Wikipedia has an excellent article on Byrd – a rich musical life. In Queen Elizabeth’s time yeere [ie. there] was a songe sen[t] into England of 30 parts (whence the Italians obteyned ye name to be called ye Apices of the world) wch beeinge songe mad[e] a heavenly Harmony. The Duke of — bearinge a great love to Musicke asked whether none of our Englishmen could sett as good a songe, and Tallice beinge very skilfull was felt to try whether he would undertake ye matter, wch he did and made one of 40 partes wch was songe in the longe gallery at Arundell house, wch so farre surpassed ye other that the Duke, hearinge yt songe, tooke his chayne of Gold from his necke & putt yt about Tallice his necke and gave yt him. One tradition is that The Forty Parts was first performed on Queen Elizabeth’s 40th birthday in 1573. Another is that the song was written for the late Queen Mary. It is certain that the song was adapted in the reign of James I to celebrate the investitures of the king’s sons, Henry and Charles. The probable truth? The unnamed duke who challenged Tallis to make this music was Thomas Howard, a Catholic nobleman and suitor of the Queen of Scots, who was put to death in 1572 for treason. His inspiration came from hearing one of two polyphonic pieces by Alessandro Striggio, an Italian composer from the Medici court who visited London in 1567. Modern performers trace the influence to the Agnus Dei (at the breaking of the bread) from Striggio’s mass. A motet? Maybe from the latin movere, to move: the movement of the different voices against one another. ** Modern singers find this a daunting experience, like a Mexican wave of voices in which they count the beats on faith. 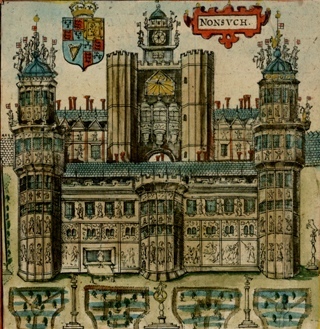 The first performance probably took place in 1570 at Nonsuch Palace (at the time, Arundell House), inside an octagonal hall within one of the palace towers: the eight choirs faced each other across the balconies, surrounding the audience with their harmonies and counterpoint. Someone got goosed at around 9:45! In 2011 BBC3 broadcast a radio show devoted to the song and its influences – 1h 30m (requires Real Player). ** The French mot is another source. ps. The original link for the song on this post is here, with the amusing bum (pinched) note at 9:31. Plus there is a permanent sound installation in Canada, which projects the forty parts through forty speakers arranged in an oval.